Facebook Interests are one of the most valuable targeting options for Facebook advertisers. 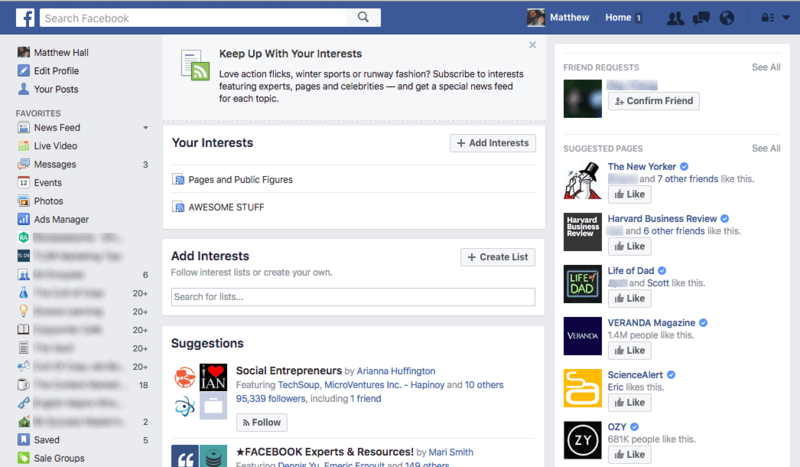 However, I feel Interests could be improved to deliver more value to Facebook users. Here are a few suggestions that could improve the usability of Interests. User “Interests” inform advertising targeting interests. 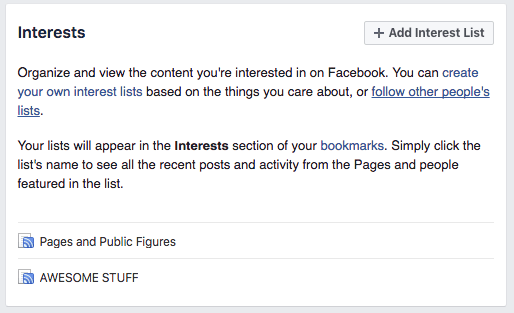 Since Facebook is very advertiser-friendly (and in a way that doesn’t necessarily violate user trust), subtly encouraging users to deepen their self-categorization through adding interests delivers on Facebook’s business goals. Interests isn’t being phased out for some reason. Naturally, developing these suggestions doesn’t make a lot of sense if the feature is being replaced with something else (better!) in the near-future. My suggestions for the Interests section depend on whether we want to keep the Interests and Add Interests pages separate. Let’s start with keeping these pages separate. Not sure what I’m supposed to do with this. I have no clear reason to click the “+ Add Interests” button on the upper-center of the page. When I do click the button, however, the value proposition is clear: Interests are a way for me to view groups of Pages, people, and Interests simply by clicking the Interests link on my Bookmarks. So how do we encourage users to explore this just a little further so they can see how Interests are valuable to them? Microcopy could be a good place to start. Though it’s a bit obvious, including microcopy below the main Interests heading could be a good way to demonstrate the feature’s value. There’s a great help box on the Add Interests page we could borrow. There’s also copy on the help page for Interest lists. Not bad! At least users can get an idea of how Interests can shape the stories they see on Facebook. This might make them more likely to click that button and explore the feature. Option 2: Why Not Combine the Pages? 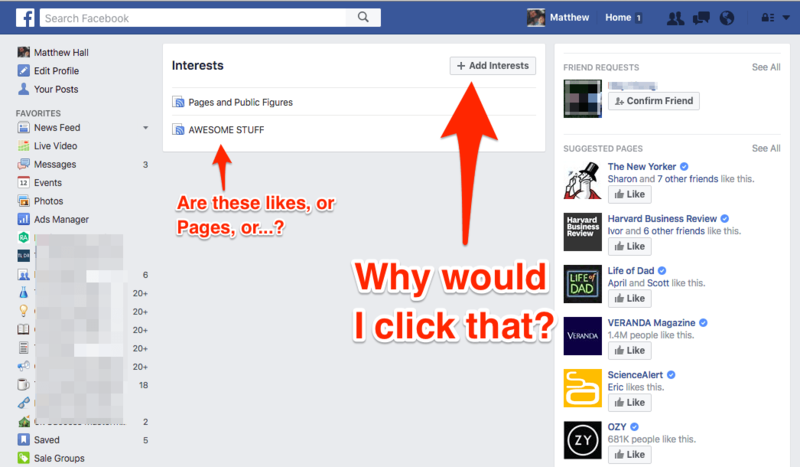 Here’s another idea: why not simply combine the Interests and Add Interests pages? Simply placing the “Add Interests” beneath the “Interests” lists could increase the value of the page. Not bad, right? A little cluttered, but it delivers a compelling case for the feature right away. Users are naturally directed to add Interests lists and are even given examples of what a “good” Interests list looks like just below. This would be ideal to encourage users without Interests lists (like me) to get started experimenting with the feature. I’m inclined to think the second option is better because it delivers a more natural-feeling UX. There’s less need to over-explain every feature and section. This seems to fit well into Facebook’s design aesthetic. 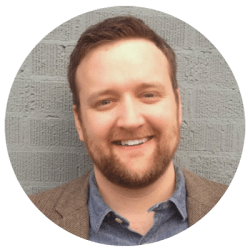 It needs to be intuitive enough for billions of users to immediately understand and unlock the value of Interests. With all the data a UX content strategist could hope for, Facebook’s in a great position to test these options and pick the solution that delivers the best results. Of course, since I’m on the outside, maybe these suggestions are totally off base. Maybe Interests is the subject of deep internal political turmoil, and even mentioning this has unwittingly drawn me into a microculture war. But barring those unlikely scenarios, hopefully these suggestions can help the Interests feature get a little more mileage and connect Facebook users with the stories they care about.